OXFORD, Miss. 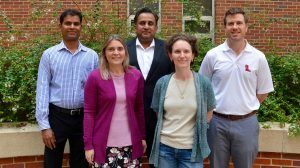 – A collaborative effort by researchers from multiple schools and departments earned the University of Mississippi a $346,641 Major Research Instrumentation award from the National Science Foundation for the acquisition of a new field-emission scanning electron microscope. The state-of-the-art microscope will enhance research capabilities for the School of Pharmacy, the School of Engineering and the College of Liberal Arts. Expected to arrive in October, the instrument will be housed in the School of Pharmacy, a convenient location for many of the departments involved. “It was a great accomplishment by the whole group,” said Soumyajit Majumdar, principal investigator for the award, professor in the Department of Pharmaceutics and Drug Delivery and the School of Pharmacy’s associate dean for research and graduate programs. “Getting extramural funding is a challenge, and this is even more exciting because it is a universitywide achievement. Scanning electron microscopes focus beams of electrons onto an object’s surface to create images with high magnification and resolution. The instruments can be used to assemble microchips, conduct genetic testing and test new medicines. This will be the most advanced electron microscope at Ole Miss, replacing the existing device that has supported research programs over the past 17 years. Vijayasankar Raman, a research scientist in the National Center for Natural Products Research, serves as a co-principal investigator for the grant along with Brenda Hutton-Prager, assistant professor of chemical engineering, Jennifer Gifford, assistant professor of geology and geological engineering, and Amala Dass, associate professor of chemistry and biochemistry. Raman has overseen UM’s existing scanning electron microscope facility since 2011. Traditional researchers won’t be the only ones to enjoy the microscope. With 10 UM departments involved in its proposal, at least 14 existing undergraduate and graduate courses will use the instrument, allowing more than 500 students to access the microscope for their own research purposes. The university also plans to involve neighboring institutions, high school and community college students, and K-12 students and teachers through outreach programs. Funds for the microscope are provided by grant number 1726880 from the National Science Foundation.